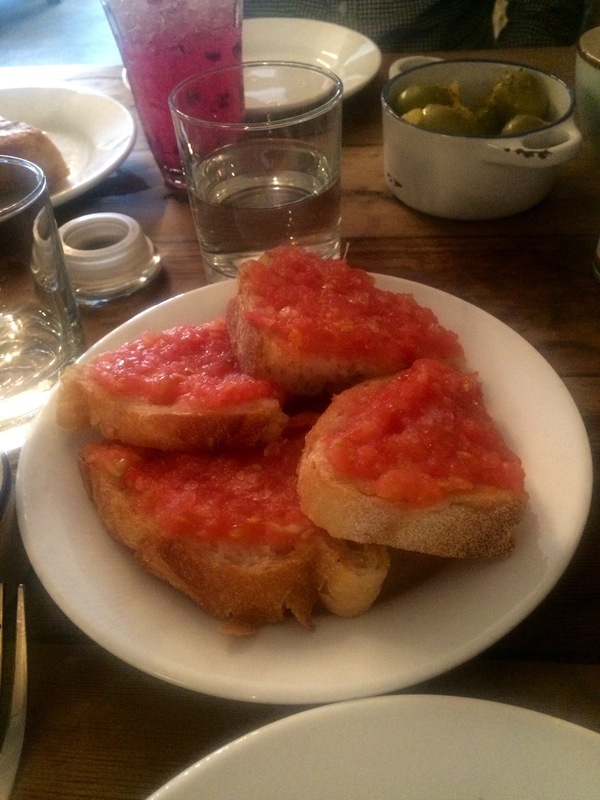 If you’re looking for a hip Hackney hangout where the cocktails are as tasty as the sharing plates, then you have to try Boceto, a delightful little tapas bar smack bang in the middle of the bustling metropolis of Mare Street. 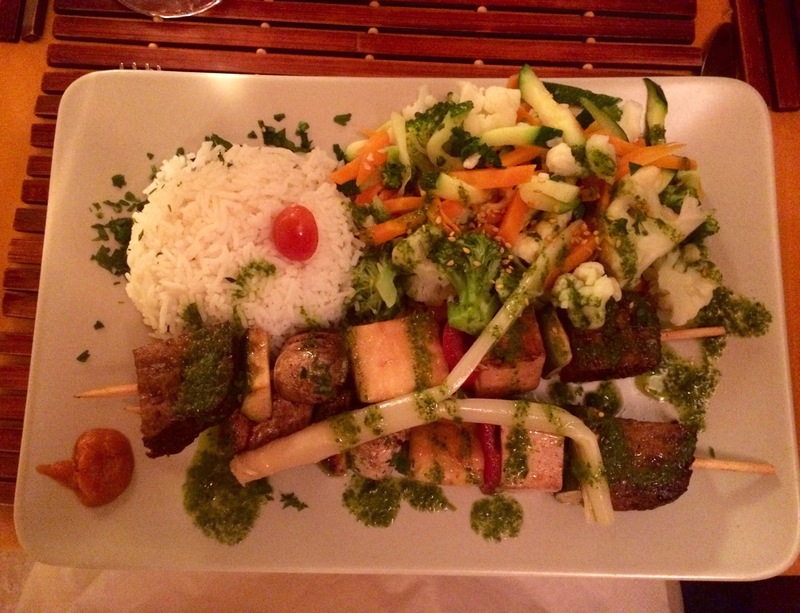 I stumbled across Boceto while browsing eateries on Google Maps (I often can’t find what I want on review websites), as I was in the Hackney area and wanted somewhere new to try on a date night. When we arrived the place was dead, which wasn’t a reassuring sign, but we were hungry and the idea of £5 cocktails appealed. Because of how quiet it was we could choose where we wanted to sit, which gets a big thumbs up from me. I’ve been to restaurants of a similar size and with the same lack of punters in the past, where the waiting staff have been pernickety about where we could and couldn’t sit. Puts me right off, that does. The decor is industrial chic with a DIY twist: exposed brick walls, green hanging plants, big bags of coffee and limited edition Estrella on display, spirits hanging from chains at the back of the bar. There’s loads going on in a relatively small space. A really interesting detail that I only noticed later on in the night was that two pence pieces had been stuck all over the bar front, giving a really stylish, brassy look. I also appreciated the selection of light-up globes towards the back of the restaurant. A nice touch, hinting on the imported feel and cuisine. We ordered cocktails to start us off, of course. I went for a cherry and coconut crush, a rich and decadent mix of cherry brandy, Koko Kanu coconut rum (a more refined Malibu), Wray and Nephew rum, coconut milk and lime. 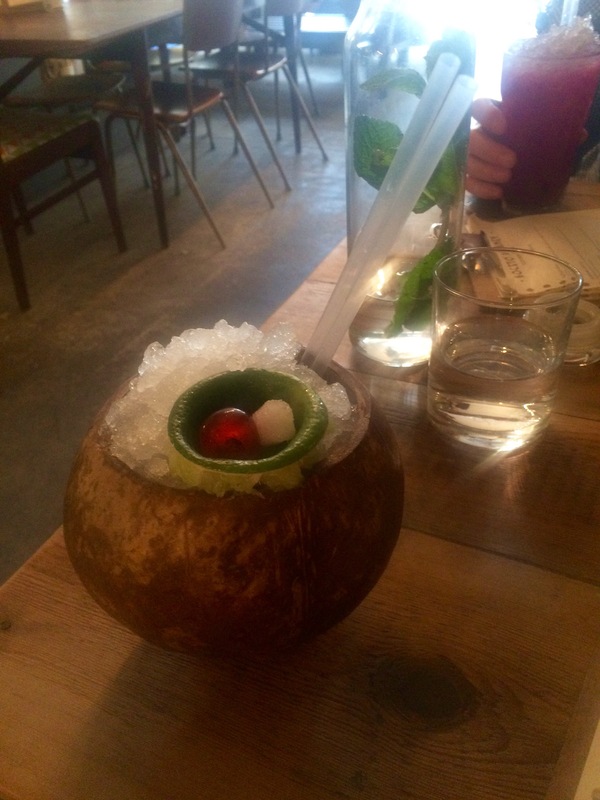 It was served in a coconut, with a lime on top that had a flaming sugar cube inside (the lime in de coconut). Unfortunately I didn’t get a snap before the fire had gone out, but it was fun while it lasted. We were brought and hydrated with complimentary mint-infused water, which was a nice touch. NB: apologies for the ghostly hue of the photos. I was pleasantly surprised at how veggie-friendly the menu was. My other half, Dom, is vegetarian; unlike myself, I’m a fishy fraud. Half of the options on the menu were vegetarian, which meant we had loads of choice. I’ve been for tapas in the past where the only meat-free options were potatoes and bread, which makes for a rather beige spread, so we were really pleased with this selection. Toasted sourdough topped with chopped tomatoes and extra virgin olive oil. The tomatoes were well-seasoned and lusciously slathered in garlic, and the sourdough soaked up the oil beautifully. Croquetta. Up there as one of my favourite plates. 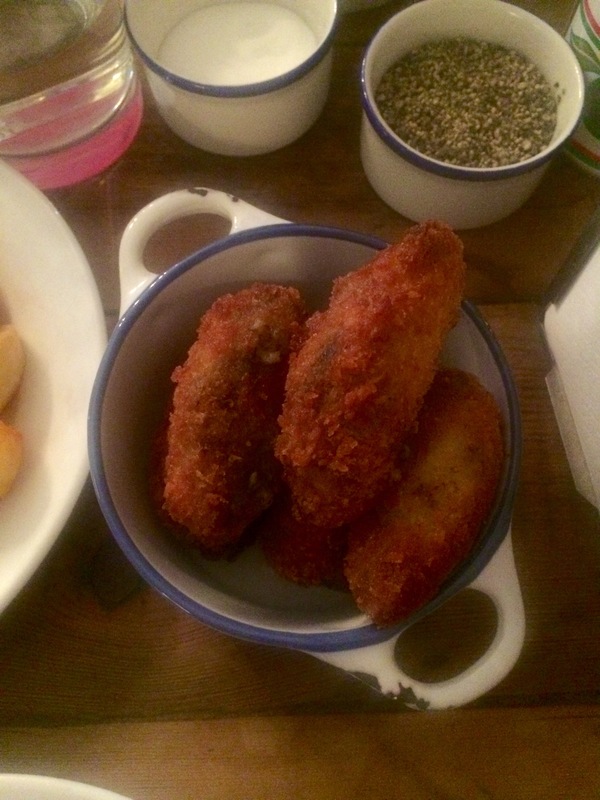 Homemade breaded croquettes filled with creamy chopped shiitake and chestnut mushrooms. Divine. Padron peppers; a classic. 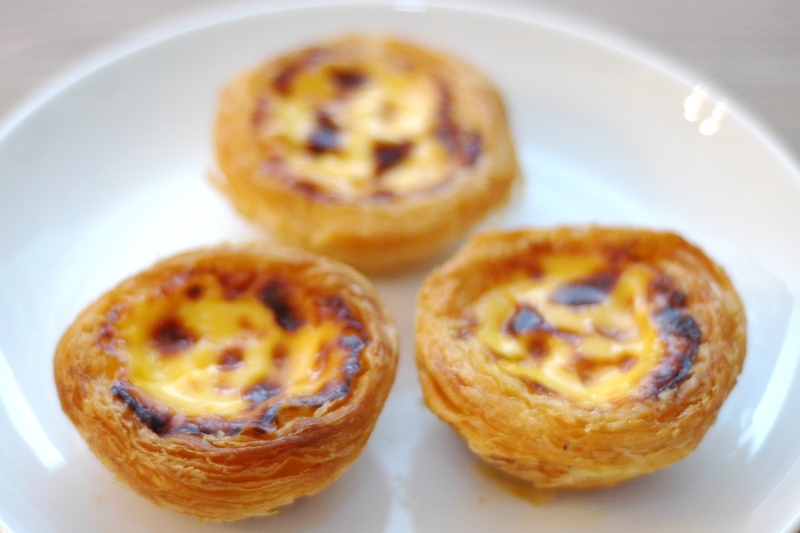 Though they were big and juicy and covered in crisp rock salt, they were a little underdone for my liking. 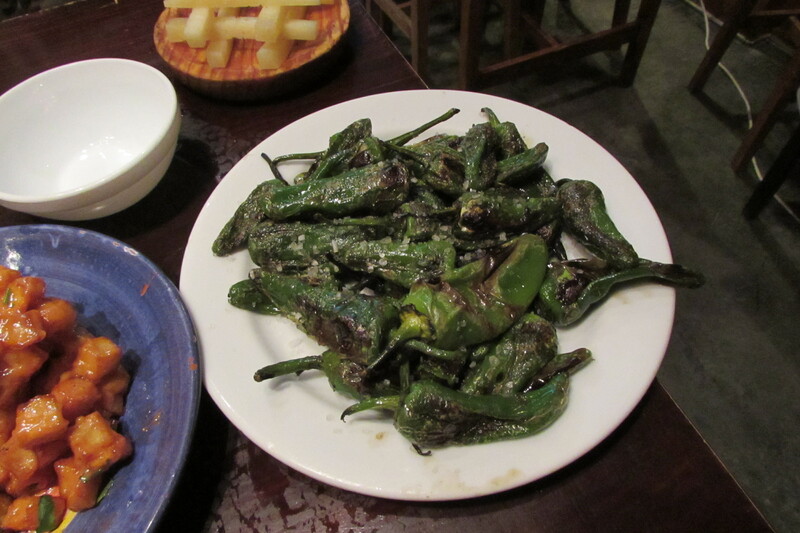 I like my padron peppers well-cooked and shrivelled. Spanish tortilla. Another staple choice. Cheesy, potatoey, eggy. Ticked all the boxes but wasn’t a knockout. Orange-stuffed olives. Huge green olives, filled with dainty orange slices and rolled in oregano. I’ve never come across this flavour combination before, but it works really well. The tarte taste of the olives and oregano were offset by the citrusy sweet orange slices. Definitely order these. Patatas bravas. Crisp potatoes topped with a rich and spicy tomato sauce and the satisfyingly creamy and garlicky aioli. 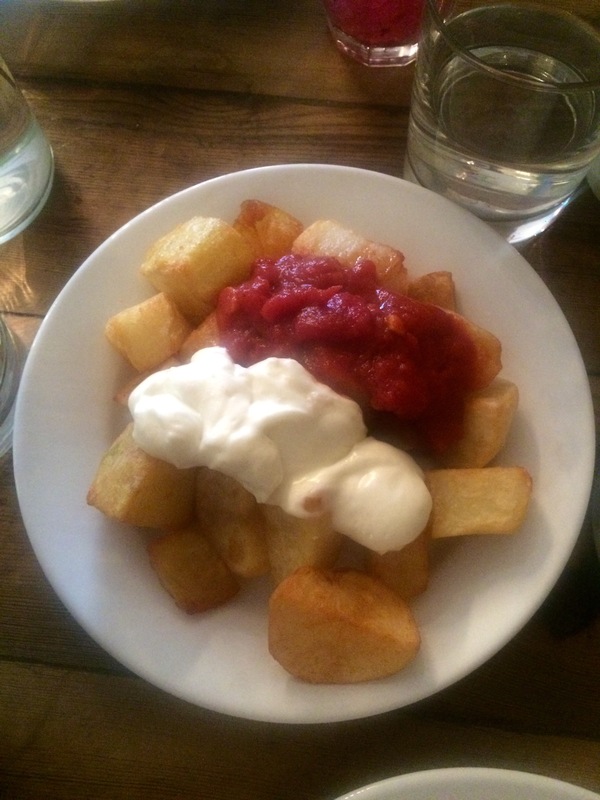 You can’t not order patatas bravas when having tapas. 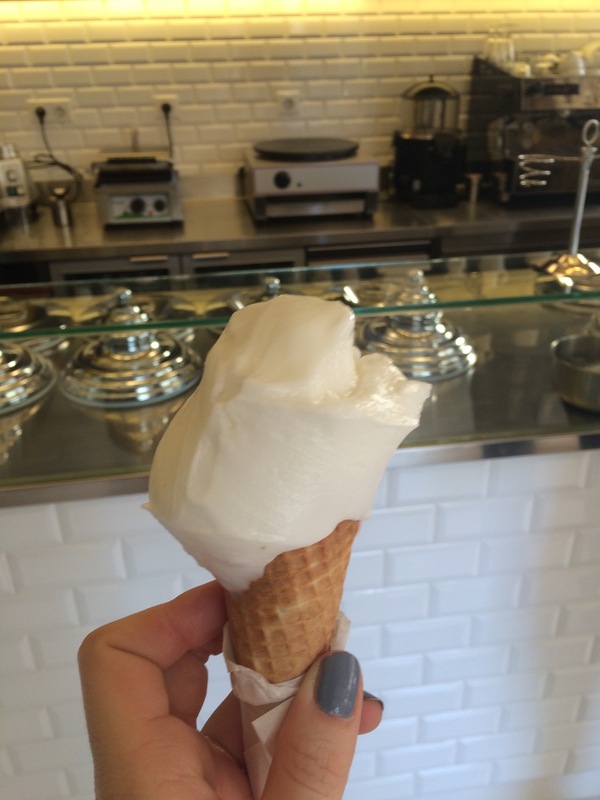 And of course, there was room for dessert. 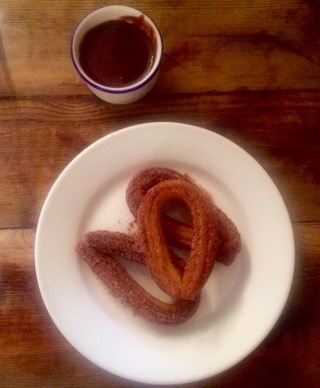 We shared a plate of cinnamon-doused churros with a warm chocolate dipping sauce. A delicious end to a top meal. 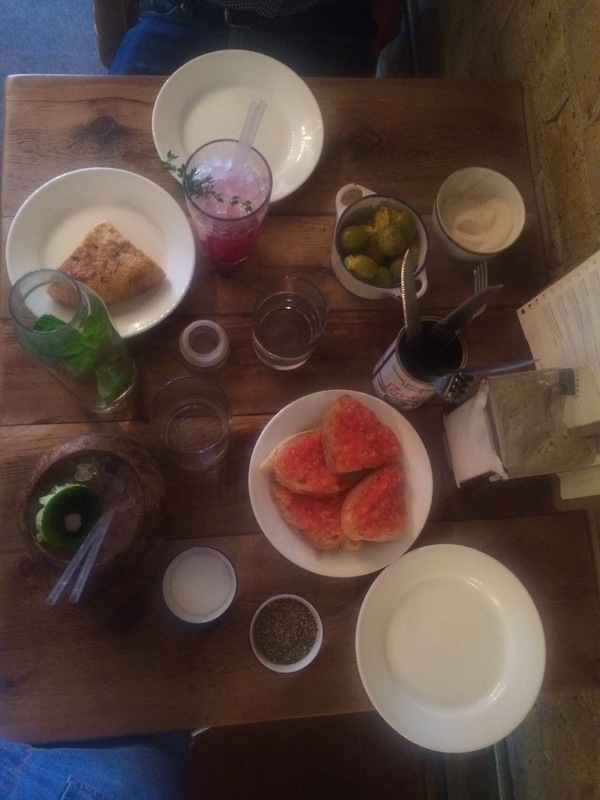 The staff were friendly, unpretentious (it is in Hackney after all) and chatty. The only thing missing was more people. Having opened up in after Christmas 2015, the place was very quiet. 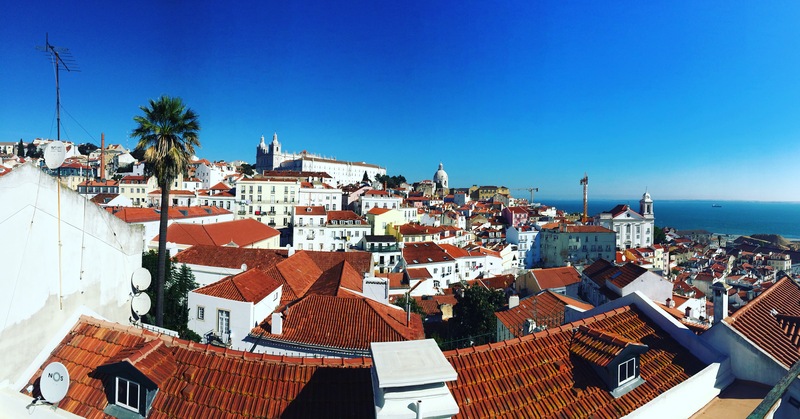 I hope it remains as it’s a fantastic spot. 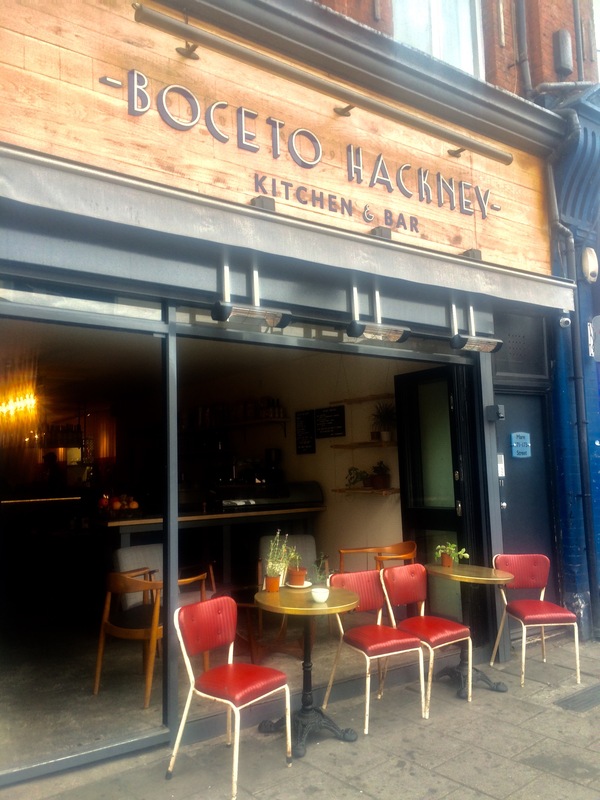 Check it out: Boceto Hackney, 171 Mare Street.